Willie Adler - AllAxess Platinum Series - The Willie Adler Destructional Video - The most personalised and interactive guitar lessons ever made.Willie Adler – AllAxess Platinum Series | The Willie Adler Destructional Video – The most personalised and interactive guitar lessons ever made. Pick up this great package today for $19.95! Willie Adler and All Axess have teamed up once again to offer you The All Axess Platinum Series - "Destructional" Guitar Lessons! The All Axess "Platinum Series" contain the most interactive and personal music lessons ever made, featuring never-before heard audio and video content, downloadable session files plus interaction with the artists! 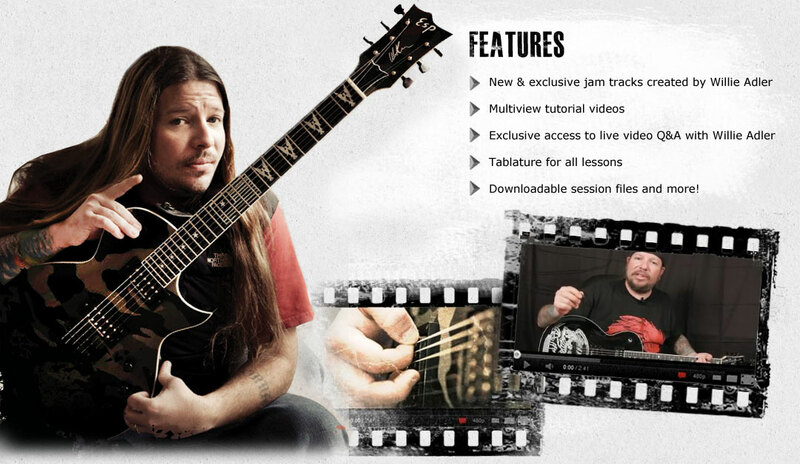 Also Included are 6 new, never before heard "jam tracks" and audio loops produced solely by Willie for this lesson. The tracks are engineered to allow users to not only learn but to use and improve improvisational and compositional techniques. The jam tracks include guitar and drum parts and are in session files and audio stems which are yours to download. On top of all this you'll be given EXCLUSIVE access to a live, monthly video Q&A with Willie Adler himself! So how much would you expect to pay for this? $80.00? $100.00? You can get this fantastic package for only $19.95! So what are you waiting for? Purchase yours today!